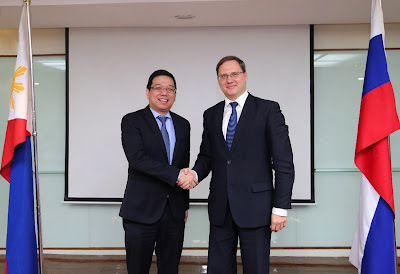 Department of Trade and Industry Undersecretary Ceferino S. Rodolfo and Ministry of Economic Development Deputy Minister Alexey Gruzdev met in Manila on April 19, 2018 for the co-Chairs meeting of the Philippines-Russia Joint Commission on Trade and Economic Cooperation (JCTEC). The JCTEC is a mechanism to improve bilateral economic relations between the Philippines and Russia. During the meeting, the following areas for collaboration were discussed: trade and investment promotion, industry development, labor, higher education, agriculture, energy, transport and atomic sphere and space exploration. The co-chairs expressed that with the highest level of support from President Rodrigo Duterte and President Vladimir Putin, both sides are geared towards enhancing trade and investment relations. This is achieved through the following initiatives: trade promotion, accreditation of products for export, utilization on the the Eurasian Economic Union Generalized System of Preferences (EAEU GSP), proposal for a Free Trade Agreement (FTA), and updating of the 1992 Investment Promotion and Protection Agreement. On trade promotion, the Philippines solicited the support of Russia for increased participation in their trade fairs and promotional activities. In this regard, the Philippines expressed its interest to participate in World Food Moscow on September and MEBEL Furniture Fair on November to showcase its food and furniture products to Russia. To enhance trade, both sides agreed to exchange the final results of the mutual veterinary missions for the audit of Philippine seafood and seafood products and Russian meat products, once finalized. The audit was undertaken to ensure the safety of consumers against diseases and contamination from these export products. Updates on established business arrangements related to import and export of products, supply of engineering and design for steel structure, supply of automobile and trucks, and pipeline transport and construction that were initiated during the official visit to Russia of President Duterte last year were reported during the meeting. The Philippines sought the assistance of Russia on fully utilizing the EAEU GSP. The EAEU GSP is a unified system of tariff preferences granted by the Customs Union between Belarus, Kazakhstan and the Russian Federation. Selected products covered by this scheme that are imported from developing country beneficiaries, such as the Philippines, are eligible for a 25% discount on customs duties. To enhance market access, the Philippines proposed to engage in dialogue the Eurasian Economic Commission (EEC), which is the regulating body responsible for the integration of the EAEU, through a proposed Memorandum on Understanding to understand the market, operations, and regulation of the EAEU. Both sides also agreed to commence discussions to update the 1992 Investment Promotion and Protection Agreement (IPPA) as a means to attract and enhance investment relations. The co-chairs meeting was preceded by a business round table attended by fifty-three local and Russian representatives from the following sectors: aerospace, automotive, chemicals, construction, infrastructure, food, mining, energy, oil and gas and consultancy. Russia is the Philippines’ 29th trading partner, 37th export market, and 24th import supplier in 2017.